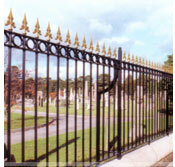 Ornamental railings and gates have always been extremely popular. They’ve changed dramatically over the years and have become more and more modern as time goes on. However, Both styles are still regularly requested. Wearside Fencing Ltd currently has an on site fabrication shop with a highly trained welding and fabrication staff which can manufacture almost any design as requested by the client. We can give a comprehensive price for any works and will be happy to help in any way we can. 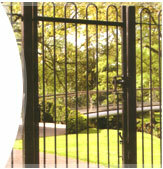 We can also give a site assessment which could help in the decision process for any railings and gates. As well as the manufacturing side, we also have several highly trained fencing teams that will install the railings and gates to the highest standard. 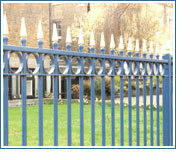 All railings and gates can also be powder coated to any colour that customers may request (please see Powder Coating). 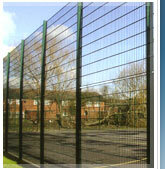 The colour can match existing fencing or allow the railings and gates to stand out. Powder coating can also be used to match company logo colours etc.